2017 is, arguably, a pivotal year in O&M strategy for the UK wind power industry, with many long-term service contracts reaching the end of their term. Here, Andrew Baggaley, Aftermarket Manager, Dana Brevini UK, considers the elements of gearbox inspection for onshore renewables. Well-established in the UK, the wind farm sector is now facing a raft of uncertainties, not least the impact of Brexit and relations with the EU - a significant proponent of renewable energy. That said, investment in the UK continues to be strong and the Wind Europe report, Wind in Power, 2016 statistics, published this month, indicates that the UK was, again, the largest EU investor in wind power, at 46% of total European financing. These trends, combined with the general challenges faced by O&M managers, mean that the consideration of gearboxes – as an integral part of the wind turbine – has never been more pertinent. Gearbox inspection is crucial and, with over ten years experience in the renewable energy sector, servicing wind farms throughout Britain, Dana Brevini UK are ideally-placed to discuss the benefits of Planned Preventative Maintenance (PPM) as well as general inspection, repair and refurbishment for onshore wind power providers. A 2014 report from GCube found that there are around 1,200 incidents of gearbox failure reported each year, one per 145 turbines in operation. With O&M costs representing about a quarter of total-life costs for wind power plants, keeping gearboxes maintained and working is crucial to the successful and profitable running of any wind power project. Similarly, WEU’s 2015 report suggests that, while many components are repaired quickly, gearbox failures can cause the longest outages, at 5.4 days. The WEU report indicates that one reason for the relatively long outages caused by gearbox failure is the long lead time in sourcing or securing spare parts. Diagnostic techniques have changed quite dramatically over recent years. In part, this can be attributed to the rapid growth of the sector and the increasing demand for high energy-generating capacity, with a trend towards larger gearboxes. All this comes with new maintenance issues and considerations and, in this respect, Dana Brevini UK enable wind farm operators and O&M providers to take a proactive approach through rigorous inspection and analysis, providing detailed reports as part of their service offering. “To inform visual inspection and determine the overall operational condition of the installation, vibration data is collected from all the major gearbox bearings using a portable dual-channel FFT (Fast Fourier Transform) spectrum analyser. In combination with powerful software, we can store, trend, extrapolate data and determine a time-to-failure, thereby introducing a less costly/reduced downtime predictive and preventative maintenance model, as opposed to a more expensive/increased downtime reactive method. By using FFT spectral analysis in combination with an enveloping filter, we can distinguish between a cage or a roller defect occurring on a bearing and identify which gear in the drive train is worn, misaligned or damaged. Clearly, this type of knowledge is of great benefit, not only to the endoscope inspection engineer who is about to undertake the remote visual inspection, but also to the client, who has a detailed and thorough assessment of the installation, making judgement calls on whether to restrict the speed or isolate the machine - a relatively straightforward task. A typical Dana Brevini wind turbine main gearbox inspection sees the initial vibration readings lead the borescopic examination. This is important because it is often necessary to persist in finding the visual evidence to confirm the VA result which is often the early warning. It follows that the exercise is not simply the collection of data, but the interpretation – before the opportunity to take a closer look is lost. In addition to the VA and visual evidence, the oil analysis is also a sophisticated tool. Specific metals and contaminants can be linked to specific components e.g. 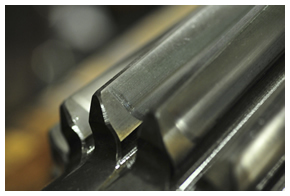 gear parts have specific alloying elements, which are different to bearings or the gear case. All the evidence builds up a picture. When this detail is added to the inspection data it can either be the final confirmation that action is needed or perhaps identify specific factors to be carefully monitored. Anecdotal information often coming from the O&M contractor will also qualify the findings so this relationship is also important. This holistic knowledge allows time to offer cost-effective planned repairs before unnecessary collateral damage occurs. Clearly, there are technological advances in diagnostic tools available to companies involved in O&M servicing for renewables, all aimed at reducing down-time and avoiding catastrophic failure of gearboxes with the operational and financial impact, that entails. While this is positive, it’s also important to know how to work with such data. Andrew continued: “The client generally wants to know what level of risk they are exposed to and the options for managing it. The data needs to be accurately interpreted to allow the operator to decide when to act because their costs of intervention are significant. The costs of terminal failure are of course a great deal higher. In many cases the outcome of an inspection is to monitor trends. The real payback, however, is realised when the presence of a critical failure mode is spotted and the underlying cause accurately identified. While inspection and repair activities are often kept independent, the refurbishment of assets is an area where Dana Brevini’s Aftermarket experience and resources can really add value.